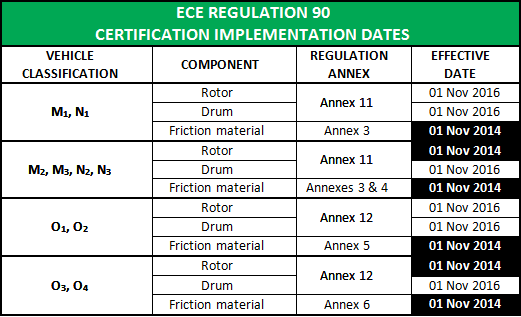 In November 2014, the United Nations-led Economic Commission for Europe (ECE) implemented its latest iteration of Regulation 90, a rule that requires all friction materials, discs, and drums for motor vehicles to submit to and pass several safety standards. brake pads and brake shoe and lining assemblies would perform safely upon installation. The latest regulation adds brake discs and drums to the mix, which must be tested and measured in the following three ways: braking performance, thermal fatigue, and braking load strength. For a part to be certified it must meet the requirements for all three metrics. Without that certification, these brake components will be unable to be sold to the European market. The new standards are currently in effect for commercial vehicle brake discs and will be effective as of November 1, 2016 for all other replacement brake parts sold or used in passenger cars, light trucks, buses, tractors trailers and semi-trailers. See the chart below for a breakdown of what specific ECE R90 rules apply to which vehicle classifications to see if your company needs any work done. 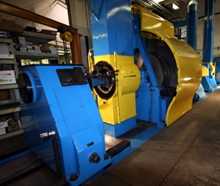 Here at Greening Testing Laboratories, we’ve put our 50 plus years of experience in the brake testing industry to work, and we’re more than qualified to perform ECE R90 certification tests for the broad range of your products. Our partnerships with RDW–the Netherlands vehicle authority–and the United Kingdom’s Vehicle Certification Agency mean that any reports issued by Greening can fulfill the testing requirements needed to obtain ECE R90 certifications. Please contact us if you have any questions or concerns about our test procedures, ECE R90 certification, timing or cost. Customer success and satisfaction are our top priorities, and we’re happy to help!